MT first heard about James Paige and his automatic typesetting machine in 1880, at which time he invested $5000 in its prospects. By 1887 he'd invested a total of $50,000, and as principal investor was putting about $3000 a month into its promise to set type more efficiently and less expensively than merely human compositors or any of its mechanical competitors like the Linotype. Believing that there were millions in those prospects, he bought the rights to the machine outright in 1889, the same year the Yankee was published; within a few more years, the machine, as chief among a series of bad speculations, bankrupted him. At the height of its development, the Paige machine had over 18,000 separate parts, and was designed (with the help of one operator at the keyboard) to set over 8000 ems an hour. 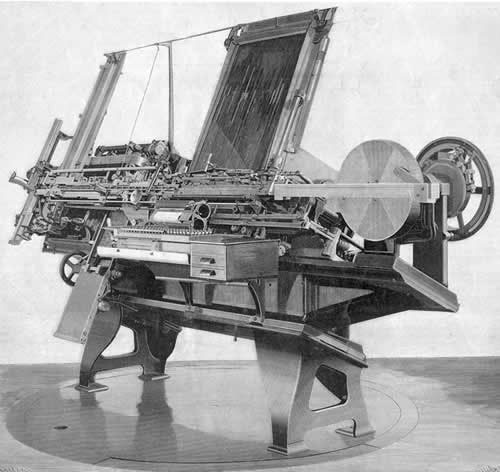 Before it could be made to work consistently, however, the Linotype machine swept the market MT had hoped to corner. Image courtesy Barbara Schmidt's Mark Twain Quotations, Newspaper Collections, & Related Resources site.